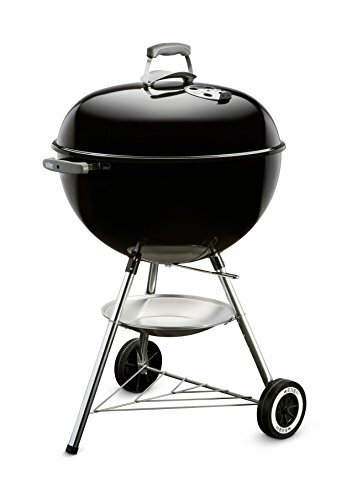 The Weber 741001 Original Kettle 22-Inch Charcoal Grill is thought of by many as the classic charcoal grill. 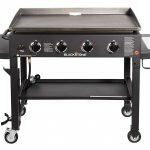 For many people buying their first grill, it offers an extremely friendly price point, durable construction, and ease of use. 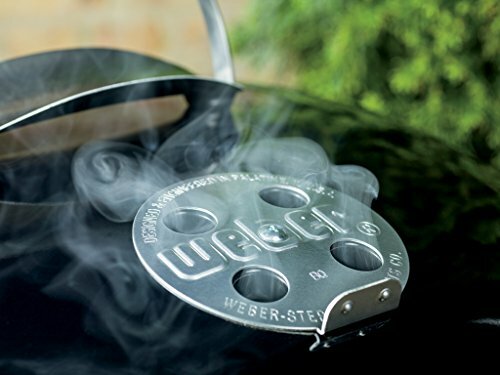 The Weber 22-inch Charcoal Grill has a history that stretches all the way back to 1952. At the time a metal worker named George Stephen Sr. worked for the Weber Brothers Metal Works at their factory in Chicago, Illinois. At that time, he was tasked with producing metallic naval buoys. This was also a time in America where grilling has quickly grown in popularity for families purchasing new homes. These old charcoal grills were often improvised from brick, offered little to no heat control and frequently flared up or simply smoldered out. The Weber kettle grill addressed all of these issues so easily that it still maintains much of its basic design to this day! The steel kettle and domed lid come with a durable Porcelain-Enameled layer and include glass-reinforced nylon handles as well as a heat shield. 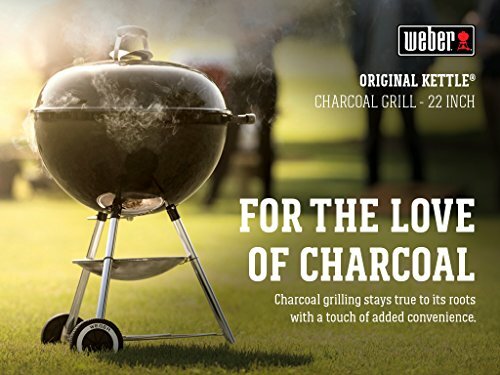 This provides the Weber 22-inch kettle charcoal grill with superior resistance to rust and corrosion, while also helping to protect your hands from being burned when opening the lid. 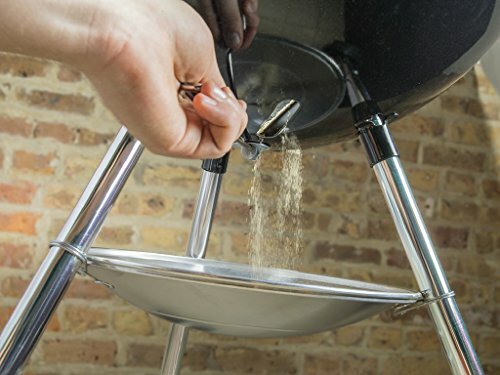 The grill is supported by a tripod base with two wheels, which makes it easy to move or reposition. The tripod legs also accommodate an ash catcher tray, which also helps prevent fugitive embers from falling on your deck during or after a grilling session. 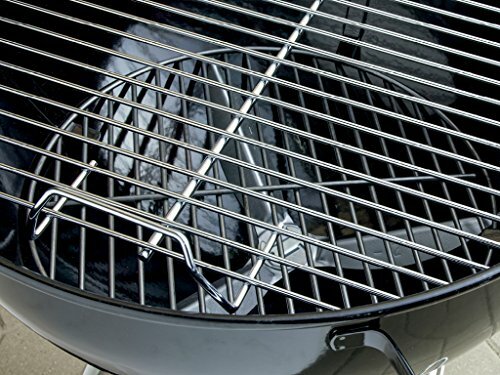 The 22-inch grill grate is made from plated steel. It provides a generous 363 square-inches of cooking space. 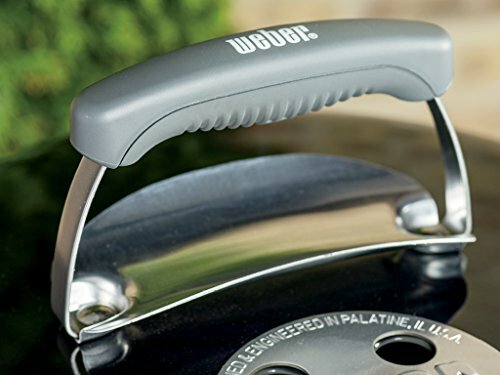 The Weber 22-inch kettle grill is very easy to assemble and can take under 15-minutes, requiring little to no tools at all. The kettle bowl and domed lid are designed to be durable and are protected by a porcelain-enameled layer. The tripod legs can sometimes feel a little wobbly. However, they are designed not to fail. As time goes on the thin metal of the ash pan can suffer from the odd ding or dent, which may cause it to feel loose in its place. 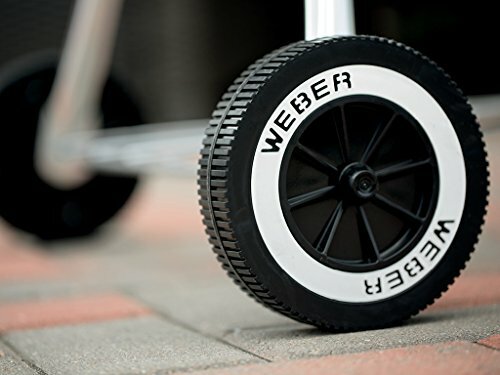 For most people, the Weber 22-inch charcoal kettle grill is their first grill or a charcoal grill that they keep at the family cabin or timeshare. It has a time-tested reputation for durability and versatility for its price point. The 363 square-inches of cooking space is more than enough to grill hamburgers, bratwursts, or steaks for your average family of four. The dampers on the bottom of the kettle and the top of the domed lid allow you to control the temperature of the fire. 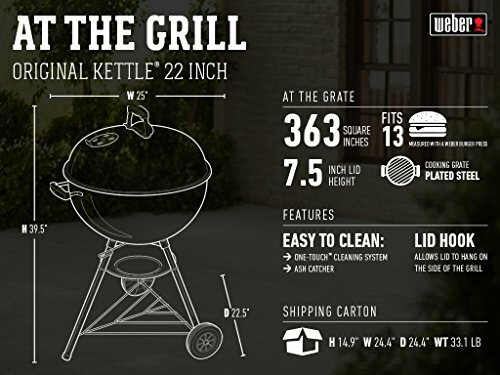 If you would like to multi-task it for hybrid grilling or a slow-and-low session with indirect heat, the bowl of the kettle is large enough to accommodate a modest amount of charcoal on one side, which allows you to place the meat on the other side. This configuration can accommodate a spatchcocked chicken, rack of pork spare ribs or even a modest sized pork shoulder. However, something as big as a flat brisket may be too large for this style of indirect heat grilling. 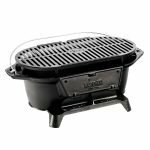 It’s also worth noting, that while the Weber 22-inch charcoal kettle grill comes with a solid-state grill grate, they do sell a hinged grate. 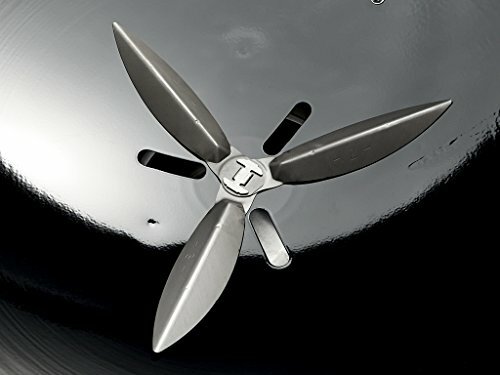 This would allow you to reload charcoal briquettes or add wood chips for longer grilling sessions. 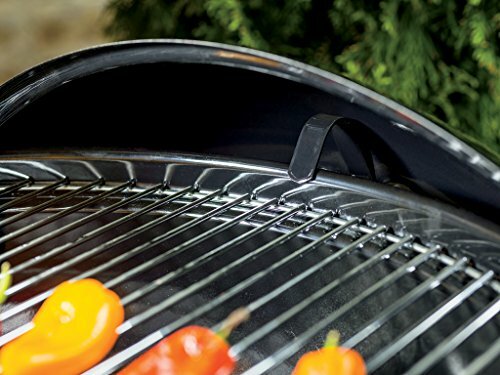 The Weber 22-inch charcoal kettle grill provides 363-square inches of grilling space on a steel plated grate. 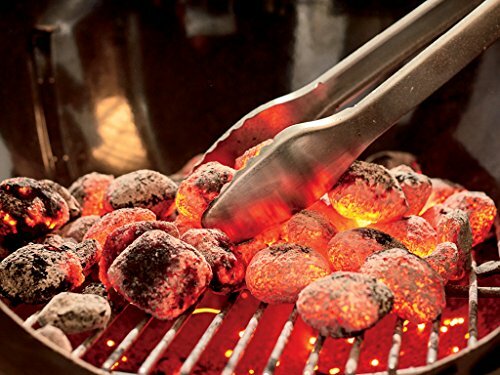 Like all charcoal grill, ash and lingering embers need to be addressed in a reasonable amount of time. The general safe procedure for this is to close all the dampers immediately after you are done grilling. This will eventually starve the fire of oxygen and suffocate it. Ideally, you want to wait 24-hours before then emptying the ash into a metal bucket. If necessary, you can stir in a little water into the bucket to ensure that any lingering embers are fully extinguished before disposing. Yet you should never pour water into the fire bowl as water and ash together are corrosive, which could shorten what should otherwise be the long life of the grill. The grill grate will also need to be cleaned after every grilling session. The easiest way is often to let the remaining fire dry out any stock on material or other cooking debris. You can then give it a vigorous scrape down with a wire brush. At the start of each grilling session, you can also lightly grease the grill grates with an oiled paper towel and a pair of tongs. This can help reduce the chances of material sticking to the grate while you cook. 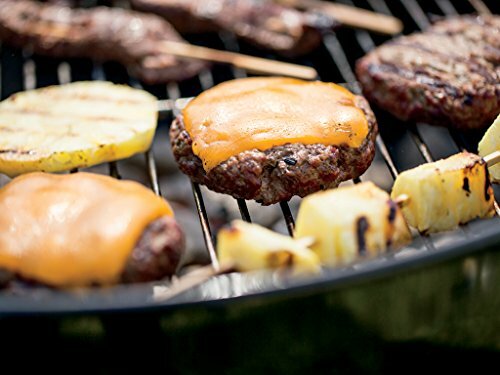 There are many reasons why the Weber 22-inch charcoal kettle grill has stood the test of time. It is durable, easily portable, easy to use, easy to clean, easy to control, and comes with a friendly price point. For many people, it’s the first charcoal grill they buy with their first home, or it’s their long-trusted grilling companion at the family cabin.